of every month at 11:00 AM. office to register for the class. month prior to the date of baptism. Please read below for information on Baptismal Policy and requirements. ​ sábado de cada mes a las 11:00 AM. para inscribirse en la clase. ​ por lo menos 1 mes antes de la fecha del bautismo. Por favor lea lo de abajo para información sobre la política bautismal y los requisitos. 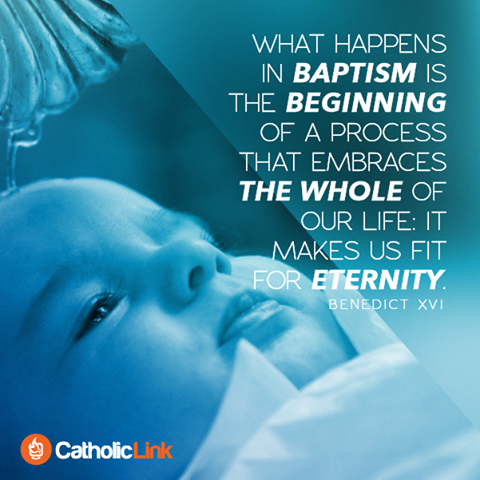 The Sacrament of Baptism is the sacrament that begins our new life, our life in Christ. Baptism washes away original sin and, in the case of those who have reached the age of reason, particular sin. We are made a member of Christ’s body, the Church. We are filled with sanctifying grace. We receive the theological virtues of faith, hope and charity, as well as the gifts of the Holy Spirit. Baptism is celebrated by pouring holy water or immersing one in the Baptismal Font. And the celebrant recites the words, "I baptize you in the name of the Father, and of the Son, and of the Holy Spirit." This is called the Trinitarian baptismal formula. The one receiving the sacrament is immersed or water is poured three times – once as the celebrant says, "in the name of the Father," once as he says, "and of the Son," and again when he says, "and of the Holy Spirit." The celebrant or minister of Baptism is usually a bishop, priest or deacon. In an emergency, however, anyone can baptize as long as the intention is to do the will of the church and the Trinitarian formula and water are used. Baptism is not only the first of the seven sacraments; it is also the basic sacrament. How? Unless a person is baptized, none of the other six sacraments can be received. Only a baptized person can be confirmed. Only a baptized person can receive absolution in the Sacrament of Confession. Only a baptized person can receive the Sacrament of Matrimony. Only a baptized man can be validly ordained a priest. Baptism first gives a person the supernatural life, whereas the other sacraments provide for the restoration, or growth, or healing, or communication of the supernatural life. As we shall see, the moment we are conceived in our mother’s womb, we receive the principle of the natural life of our body, called the soul. When we are baptized, our soul receives its principle of the supernatural life. The foundation of supernatural existence is conferred by the Sacrament of Baptism. Baptism clearly shows what the Catholic Church understands by the sacraments. They actually give, cause if you will, the grace which they signify. There need be no deliberate contribution from a newborn child. The sacrament itself confers grace from God just because the infant is baptized.